Northlight 29 Pastel Pink White Purple Floral Spring Easter Egg Ornaments 3.25"
Flocked Pig Figure (Green - turquoise) - This Little Piggy is SO CUTE! 9" Flocked Bunny Figure (Green - turquoise) - SO CUTE! 5.25" Flocked Bunny Figure (Hot pink - violet) - SO CUTE! Details about 9" Flocked Bunny Figure (Hot pink - violet) - SO CUTE! 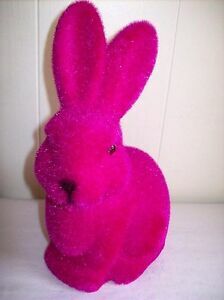 9" Flocked Bunny Figure (Hot pink - violet) - SO CUTE!